Building on the success of the first generation Ryzen processors, AMD have introduced their new 2nd generation which now include the amazing Radeon Vega graphics! To date, all AMD Ryzen processors for desktop PCs have been pure CPUs. In other words, they must be paired with a standalone graphics card. However, the new AMD Ryzen Processor with Radeon Vega Graphics is a little different - graphics are built right in! You can simply plug your monitor into a compatible motherboard and go - no graphics card needed. The included Radeon Vega graphics are ideal for compact or affordable systems, where system size or budget may not allow for a standalone graphics card. AMD has been building processors with built-in graphics since 2011 but this is their fastest yet! For users thinking about building an affordable gaming system, for example, the AMD Ryzen 5 2400G is a good place to start. It can easily tackle popular games like DOTA 2, The Elder Scrolls V: Skyrim, CS:GO, or Rocket League. And if you find that you'd like to upgrade to a faster standalone GPU some time later, you can do that! Last but not least, let's not forget that the built-in graphics have full support for DirectX 12 and Vulkan too. You’ve already seen that the 2200 and 2400 can comfortably play games but games are not the only thing a graphics core can do. People also watch movies and TV shows from all different sources on many different types of monitors. The Radeon Vega graphics built into these new processors handle H.264, HEVC, and VP9 fully in the hardware for smooth, cool and quiet playback. In other words, services like Amazon Instant Video, Hulu, Netflix and YouTube are all handled by dedicated hardware inside AMD's new processor. When it comes to monitors, Radeon Vega graphics can handle any display up to 4K UltraHD, even if you also throw in High Dynamic Range (HDR) and Radeon FreeSync technology. Intelligent and revolutionary AMD Ryzen processors are designed to bring you the ultimate, high-performance computing experience. The latest revolutionary AMD multi-threaded processing technology gives you blazing fast performance when you work or play. Enjoy the most powerful graphics you can get on a desktop processor thanks to Radeon RX Vega processor graphics. The latest, most advanced Vega graphics technology delivers fast, smooth and fluid performance on the games you love to play. 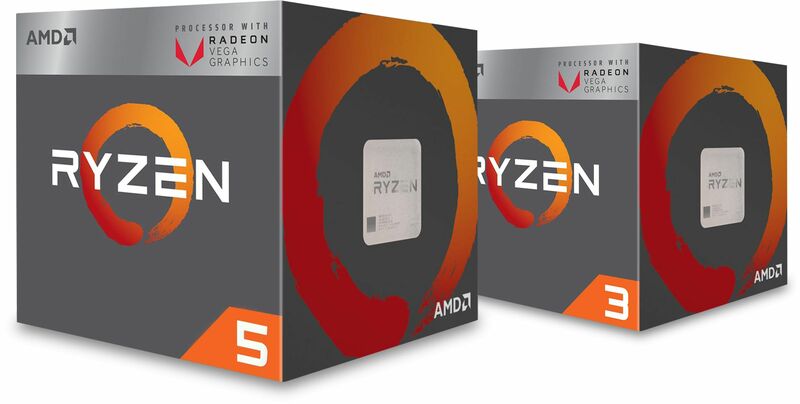 AMD Ryzen Processors with Radeon RX Vega Graphics are armed with some of the most advanced, powerful computing and graphics hardware available today, fused together in a single processor to deliver the high performance you need for demanding work and serious play, without compromise. Everyone deserves a powerful processor. Uncompromising features and smooth performance are finally the standard for every gamer and artist with advanced Radeon Vega graphics built-in and new 2nd Generation Ryzen processors. The Ryzen 5 CPUs feature 11 GPU cores to provide the best onboard graphics around so, if you plan to play games on a budget, this is the best CPU to opt for. Cutting-edge, true quad-core architecture provides the responsiveness and performance you'd expect from a much pricier PC with advanced Radeon Vega graphics built-in. The Ryzen 3 CPUs feature 8 GPU cores that provide very good performance. Although Ryzen 3 is capable of providing a reasonable frame rate when playing games, the Ryzen 5 will perform better. If gaming is not required then the Ryzen 3 will be ideal!